In multicell network, it's useful to have a map of all the cells in a single view with all the sync link state in real time display. 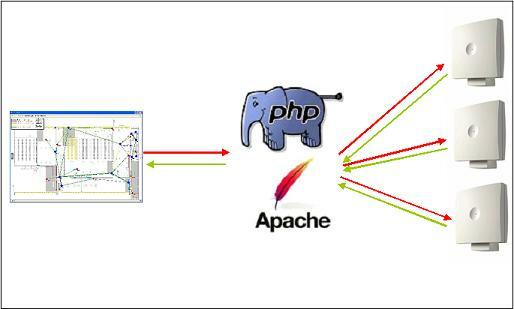 For that you will need an apache server with PHP 5 at least. You must have an access to the cells from the apache server. You must have a map of your building in jpg format with the name myDECTcoverage.jpg, and you will need a txt file with a description of each cells point with the name myDECTcoverage.txt. You will need four php script to get this map. Put these following scripts in the same directory. The second one, named draw.php, provides the jpg with the map and each cells point drawn on and the link state. You will also need the two following scripts, one to get get the sync map and one to get the sync level between each cells. Don't forget to change the user/password in these two scripts. As mention at the beginning you will need two files, one for the map and one for cells positionning on the map. So here is an example of the text file myDECTcoverage.txt. Each line represents one radio point. For Base Stations, the line begins with Bxxx For Repeater, the line begins with Rxxx. You can add information after the R or B, it will be drawn to the map. Each field is separated by ';', the first field is the name, second is the X position on the jpg (in pixel), the third is the Y position, then you will find the real ID of the access point, then the IP address, and at the end the http port. Note that for repeater IP address and port have no sense ! leave it empty. You must have one ';' at the end of each line. You must specify the http port because I use NAT feature of the PBX on my network and cells are only reachable through the IPBX. It's important to respect the repeater ID as described in the documentation. For example repeater 1 on B1 must have ID 65. If you have repeater attached to another repeater, it will be drawn as attach to the same cell. The master IP address must have the ID 1. It works in single cell solution. You must have basic authentication on DECT Cells. This page was last modified 11:56, 26 September 2018.